Go dotty for Dogs! 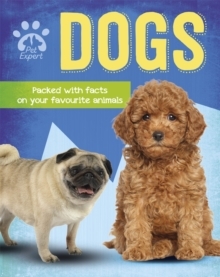 Discover amazing facts about your favourite animals and become a pet expert!Do you know your Pugs from your Poodles? Are you potty about pooches? Whether you own a dog or you simply love them, this book will tell you everything you could possibly want to know about these adorable animals. It is packed with tips on grooming, exercise and the personality traits of different breeds, and of course has lots and lots of very cute pictures of our canine friends. Discover a huge variety of breeds, how dogs have helped humans for thousands of years, and work out what your dog is trying to say with a sniff of its nose and a wag of its tail. The Pet Expert series explores the world of some of children's favourite animals. It is packed with fascinating facts about record-breaking animals, rare breeds, pet history and stories of famous pets from real life and fiction.